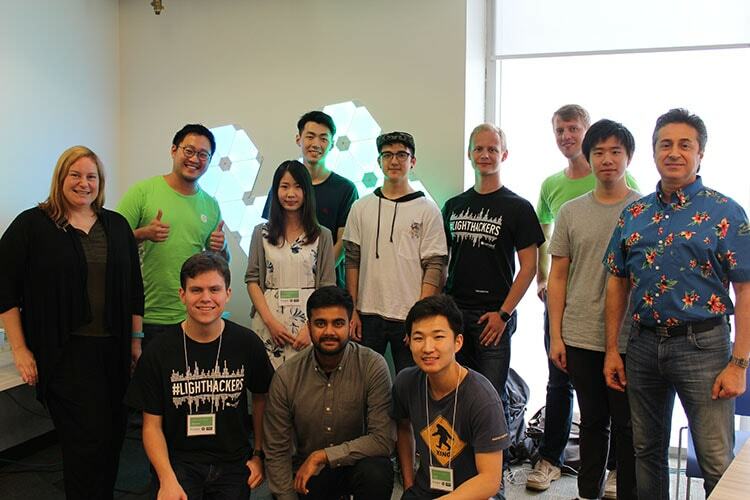 Participants of Hack the Light with DCSIL staff and Nanoleaf's Gimmy Chu (second from left) at the event this weekend. Nanoleaf, the startup co-founded by University of Toronto alumni Gimmy Chu, Tom Rodinger, and Christian Yan, brought its latest lighting product, Aurora, to U of T July 21-23 for a hackathon. The startup was hosting Hack the Light in collaboration with the Computer Science Student Union (CSSU) and the Department of Computer Science Innovation Lab (DCSIL), with students developing programs to sync Nanoleaf's new Aurora bulb panels to change colours and patterns to music. With the Aurora Rhythm, a small microphone add-on that the company has yet to bring to market, developers could create software plug-ins to make the multicolour, interlocking light panels react in different ways. Helen Kontozopoulos, co-founder and co-director of DCSIL, said the event was a great example of how the lab can work with startups in the future. “Let's de-risk a product before it goes out, and maybe even fine-tune it, with the best developers,” she said. Arseniy Ivanov, president of the computer science student union, said the hackathon was an opportunity to bring students together and hack for fun. “At night, people turned off the lights and turned on their visualizations, and it was mesmerizing to see what people did,” he said.